One of the things you can do in the Vertex theme is put a WordPress widget anywhere you like. These can be just blocks of text, or they can utilize any of the features that your plug-in set might provide. For example, in the English Catholic Women Writers project, we set up a widget that displays custom fields for the author name and a project description. They may be done already. Then, place into your page builder (preferably at the top right) a “Widget Area” module. Pop it open to edit it. Then make sure the “Widget Area” dropdown is set to Layout Builder Widget Area 1, and click the “Save Changes” button. When you update your project, the new block containing your custom fields will be in place. You can use this on your own site, of course, it will work with any theme that supports widget areas (which is to say, almost everything). 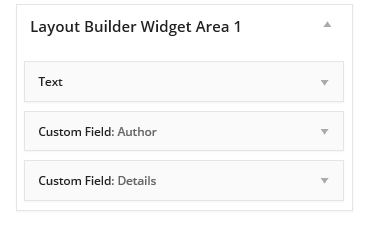 The contents of the widget itself come from the Custom Field Widget, which lets you drop any custom field value onto a page. It’s great for displaying metadata about a post, or any other content that doesn’t fit naturally into the flow of the text but you still want to display. It could be inventory or lot numbers; house addresses; source citations and so on.